I wasn’t too sure about The Kids’ Outdoor Adventure Book as its title says it has 448 great things to do in nature. 448 is a rather big number and I figured that most of them wouldn’t actually be too great. However, I was pleasantly surprised. After flipping through it, I decided there is a lot to like here. I was not familiar with the publisher FalconGuides but will surely take a look at their other offerings based solely on this book. They did a fine job and this is a quality paperback. The size is a bit too large to comfortably travel about in a backpack though and since this is all about the outdoors I would have rather had this title in an easier to transport size. The Kids’ Outdoor Adventure Book is nicely divided into the four seasons. Activities are listed under different categories within each season. There are four categories: destinations, projects, games and foods. This book has checklists so you can mark off what you have done (or mark what you want do.) There are basic activities, challenges and as an added bonus, “did you know,”and “discover more” which both list interesting info. Some of the activities also list a website with bonus video on the topic. This is a very family friendly guide and is great to have on hand for those days when you just don’t know what you feel like doing. Make leaf prints, collect herbs, try fly fishing, go on a full moon hike or eat an icicle–this book gives a lot of fun reasons to get those boys outside and having some fun or to have them reflect on the wonders of nature. 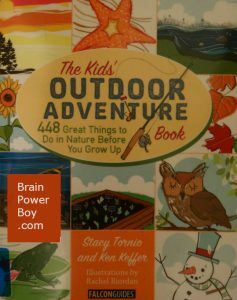 Great for boys who love to be outside, those who like hands-on learning or those who cherish nature. I need ideas for kids to forget they even have electronic game players. This book is great for that Joanne. We also have a lot of activities for boys articles on the site.